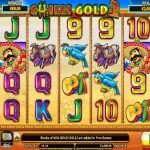 Chili Gold 2: Stellar Jackpot is a video slot game from Amaya Gaming that offers 3 progressive jackpots. The game will take you on a trip to modern day Mexico, so grab your sombrero because you will be exposed to the scorching dessert sun. The overall look of the game is very colorful and vibrant and you will hear some sounds that come from maracas and guitars. 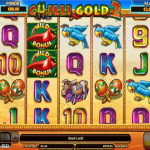 There are a couple of features in Chili Gold 2: Stellar Jackpot that will make your game play more interesting. 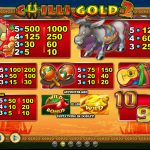 The free spins round is the first feature and it is activated by landing at least 6 chili symbols on the second, third and the fourth reel. So you can land between 6 and 12 symbols and you will receive between 3 and 21 free spins for that. There is an extra wild added to the reels during the free spins and it is also possible to get more free spins too. The jackpot game is activated randomly during the base game. The only thing that will improve your chances is to play with higher stakes. You need to pick icons and to work your way up the ladder and to receive one of the jackpots available Mini, Minor or Major. Chili Gold 2: Stellar Jackpot is a interesting game to play. It is part of the games that offer progressive jackpot from Amaya Gaming. The design of the game is very loud with all those colors and details. But, we must admit that the most interesting part is the fact that you can play the jackpot game after all. We like everything we see in this game and the idea that you can win huge is quite appealing we must say. For a fantastic enchanted adventure you should consider playing Charms And Witches a 5 reel slot by NextGen.